In 2013, Texas Sen. Ted Cruz had proposed legislation that would have prevented the atheist gunman from buying the weapon he used to slaughter women and babies inside a Texas church Sunday. Democrats, however, filibustered the bill based on partisan politics. Appearing on Fox News Monday, a visibly emotional Cruz said that he and Iowa Sen. Chuck Grassley had tried to keep guns out of the hands of criminals. “But two, and this is an even more critical piece — If it had been reported to the background database, when [the gunman] went into academy to buy these weapons, he lied on the forms – that is a felony to lie on those forms,” Cruz explained. 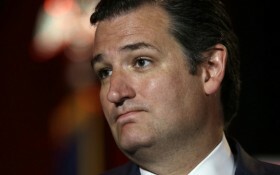 Cruz then placed blame on the failed legislation on the feet of Democrats — specifically, former President Barack Obama.